First an apology, I have been woefully bad at blogging this year, both here and over at “Musings of an Orthodox Jew”. It comes from just taking on too much at once, something has to give. So far to has been this blog, but that is because I have had to devote extra time to preparing shiurim. I now give two shiurim a week at a weekly study session, one in which we are studying maschta Menachos the other, the laws of prayer. Thus, blog posts will be fewer, but will still appear from time to time. SO why have I taken time out for this post? Previously I blogged about apologising with one account while attacking with another. Of course that caused a furious storm of denials from the “messianic jews” involved, they were none too happy to be caught out using multiple accounts for fake apologies! This time, they were more careful and only used one account, what they lacked was self-control! So first, there was an exchange in which they thought they could score brownie points by attacking me because I had an error in a blog post. Yes, its true, I’m human and make errors (now now, don’t all protest too loudly LOL). Pointing out that I was 1) aware of the error, and 2) had corrected it months ago led to them throwing around more insults (anyone reading this surprised at that?) So a bit of evidence later and Adelphi (using the Ascii butterfly nowadays) apologised, both in the comments and by mail via the Yahoo!Answers PM function. Sounds good doesn’t it? She accuses me of something, gets proven wrong, and then does the “Christian” thing and apologises. So, lets look at the apologies (graphic files of the apologies at the bottom of this post. Yes, you are right, I was wrong. Since I was wrong and misjudged you, I will leave the forgiveness part up to you. I’m sorry. You did correct the story of the 4 Sages, and I, unaware of your other answers, blamed you for continuing in error. 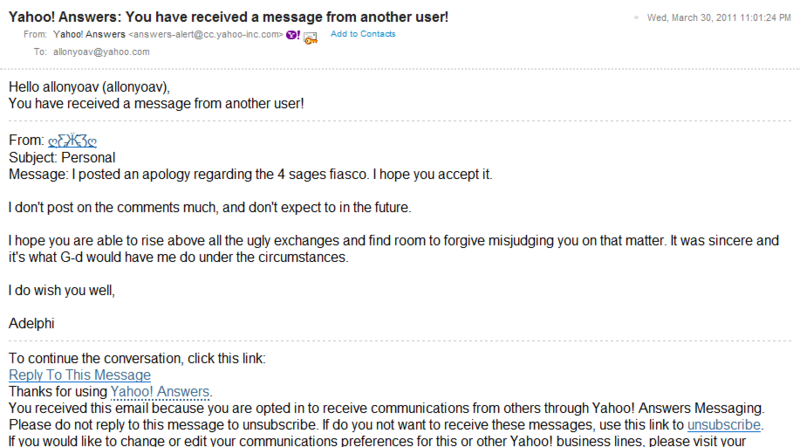 Message: I posted an apology regarding the 4 sages fiasco. I hope you accept it. I don’t post on the comments much, and don’t expect to in the future. I hope you are able to rise above all the ugly exchanges and find room to forgive misjudging you on that matter. It was sincere and it’s what G-d would have me do under the circumstances. Even better, right? Sounds sincere, she’s going to stray out of the comments in the future etc. Well, aside from the holier than thou attitude quickly seized on by her “messianic jewish” cohorts about how the apologise and I am so evil as to not take them seriously. Kinda spoils the holier than thou stance if you make it look like your apologies are political tools for debating points. But, then, we have seen from their actions that the truth is, that IS what apologies are to them, not a sign of remorse, but a tool to try to score points. Heh, it also helps if you have some self-restraint; not a noticeable trait amongst the “messianic jews” of Yahoo!Answers. So instead of the more cleverly thought out, amusing and enjoyable insults (yeah, it can be fun when insults are properly constructed and not just the equivalent of a ten-year old in the school’s yard taunt), we are back to the boring, staid rubbish they love, plus a new wrinkle. Now I am a cult leader on Yahoo!Answers (damn, I really chose the wrong place for that! No groupies or money around, what kind of self-respecting cult leader has a cult like that?). And to bolster everything- attacks on Chabad/Lubavitch as a cult, accusing me of being a member of Chabad Lubavitch (hey, no point in attacking them if they cannot attack me, right? ), and thus of being a cult member! Never mind that I have frequently stated I am NOT a member of Chabad or of any Chassidic movement; nor of the fact that I have frequently stated that I generally follow the rulings of HaRav Moshe Feinstein zs’l who is solidly Litvak and far from anything Chassidic. Nope, reality does not intrude into the world of “messianic jews”, so they throw accusations around without bothering with the evidence to the contrary. Thus, yet again, we see the “messianic jews” trying to use fake apologies to build a platform to make themselves seem righteous; but failing since they have the willpower of a child and demand instant gratification. All I see here is what appears to be a honest apology for a specific incident. IMHO, it isn’t an apology for all the comments, only one. The apology seems sincere. Have you forgiven this person for that specific incident? That’s the question son. Its always amusing to see how they will try to manipulate things to wrangle out of the fact that they have been caught being dishonest again LOL Heh, I guess she fails to notice that the mailed PM is a broad one, not just for the specific incident! Heh, but then, selective blindness appears to be common amongst the “messianic jews”. And why on earth would i forgive someone who continues to blatantly insult me, lie about me and slander me? What, you think I’m a masochist that I appreciate that kind of behaviour? She wants forgiveness, shes going to have to realise that she actually has to do something for it- not mouth meaningless statements while continuing with exactly the same behaviour! Oh, and don’t call me son. You are NOT my mother and don’t get to address me in familiar terms while attempting to defend someone slandering me! Yahoo Question: Where in the Bible does it say King David entered into the house of God and ate consecrated bread? King David and his companions? Do you have a scripture? A CHRISTIAN ANSWERED THIS, CITING THE BIBLE AND HIS “38 YEARS OF LIFE EXPERIENCE” AS HIS SOURCE. What people who claim David and his men ate loaves consecrated for sacrifice fail to understand is that when David and his men ate them, they had been deconsecrated! The reason why David and his men had to have abstained from women before eating it is to ensure they were tahor (ritually pure) with no chance of being tamei (impure). See, once the bread was removed from the table on which it sat for the week outside of the Aron Kodech (holy ark), it was no longer meilah (forbidden) to non-priests, as long as those eating it were tahor. As it says in verse 7 of that chapter- the bread had been replaced that day and the loaves that had been removed supplied the asked for bread! Thus David and his men never ate consecrated bread- it had been deconsecrated by the time they ate it! The only time that Shabbos laws can be broken, is in the case of life and death- here there is no indication of that- they merely had to wait a few hours, until after shabbos, and they could have done it to their hearts content. Instead, Jesus and his followers showed contempt for the Torah and broke its commandments! YOU ANSWERED THAT QUESTION SO PERFECTLY THAT NO ONE ELSE WAS EVEN ABLE TO CONTRADICT ANYTHING THAT YOU SAID. THEY COULDN’T EVEN FORMULATE A RESPONSE TO YOUR ANSWER!!! ABSOLUTELY BRILLIANT THAT WAS! However now I feel a bit ashamed, let me read off some of the mitzvah’s that Hashem commanded to us (no doubt you know them yourself since your posts are well written and it seems that you are a master of Kabbalah as well). I feel ashamed now because you, a jew well versed in the Torah, throughout this entire post (which is on the internet for ANYONE to see) sits there and critiques who??? A fellow JEW!!! I mean sure they’re messianic and they’re not following Torah themselves but they are still Jewish! They spoke bad about you first, to which you are clearly commanded to rebuke them for and make them see their mistake. Certainly however, you are NOT to takes matters into your own hands and post a blog yourself in which you respond to them in kind, completely embarrassing them and then insult them saying that they lack self-control and are without willpower. This which you have done, without a doubt, is evil in the eyes of Hashem. Jews attacking other Jews, may G-d have mercy on us all. You evidently do not know the law concerning the MEIZID, the one who entiuces Jews away from Jduaism. “messianic jews” are NOT Jews but Christian missionaries posing as Jews in an attempt to entice Jews away from Judaism and serving Hashem! And t such a person the law sof Lashon HaRa do NOT apply! When fellow Jews are in danger from missionaries, there is no issue of Lashon HaRa when it comes to exposing them and their deceit. There is no issue of lashon hara when it comes to exposing the meizid. “messianic jews” are NOT recognised as Jews by any stream of Judaism. The vats majority of its members have zero connection to Judaism in any fashion whatsoever. The estimates of the number of “messianic jews” that would actually qualify under the halachah vary from 2-4%. Yep, thats it! So save your condemnation for those deserving of it- the missionaries in “messianic judaism”! Why do you clump all “Messianic Jews” into one category? As with any people group, not every person is 100% the same. They may have some things in common, but no 2 people are the same. Just like how not every Orthodox Jew is the same, not every Messianic Jew is the same. I accept people as they are and don’t go around pigeonholing and attacking Jews–Orthodox, Messianic, Reform, Chassidic, whatever. You may not like Messianic Jews, but they are Jews nonetheless and Genesis 27:29 still applies. Stop spewing your hate. Follow the Torah – Leviticus 19:18. For the bread thing, see 1 Samuel 21. You know, I would stop lumping the “messianic jews” together if they didn’t act as a single concerted group on Yahoo!Answers. The reality is that the “messianic jews” on Yahoo!Answers all support each other- you won’t find any of them speaking out against such behaviour instead they support those who behave in such a manner! When the “messianic jews” on Yahoo!Answers stop supporting those that engage in such behaviour, I will stop lumping them together. Given my experience on yahoo!Answers over the years i doubt that will ever happen! And nope, “messianic jews” are NOT Jews. The Torah in Shemot 12:43 removes the Jew who has coonverted to another religion from being part of the Jewish community. By not allowing them to eat from the Korban Pesach it shows that they are punished with Kares, spiritual excission, permanently cut off from G-d and the Jewish people in this world and the next. 3) They were in a state of DANGER, fleeing for their lives and the laws of pikuach Nefesh take precedence, preserving life when facing death. There was no violation of taking the bread, no violation odf the law, no violation of Shabbos or anythng else. 3) There lives were not in danger, they could have waited a few hours and gathered it then with no threat to their lives! Justify it to yourself anyway you like, by torah standards they sinned.